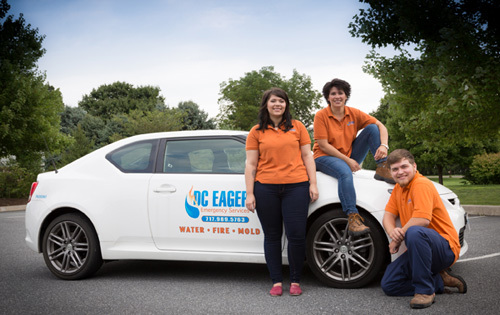 DC Eager Emergency Services provides FREE ASSESSMENTS and restores all types of property damage such as fire, water, mold, and sewer loss with products are chemical free! Located in Lancaster County, Pennsylvania, we will be on site within hours of your initial call, responding 24 hours a day 7 days a week. Darlene Eager, Owner of DC Eager Emergency Services, LLC, has been in the restoration business for 17 years. She has put together a fantastic team whom also share her love of the business, along with a passion for helping people. As we specialize in taking care of all types of property damage within a residential or commercial building (ie. mold, smoke damage, water or flooding, sewer backups, etc. ), we also specialize in taking care of the property owner. All of our products are chemical free! Why Choose DC Eager Emergency Services? We’re not a large franchise who treats customers like just another number. We are family owned business with a dedicated group of professionals who understand the issues you’re facing and have the expertise to correct them. As damage to your home can be overwhelming, we listen to your needs and keep you informed of the process every step of the way. As our services include the cleanup and dry down of all property damage, we don’t stop there. We can recommend qualified contractors that can help you repair your home after the damage has been removed and your home is clean. Upon authorization, we will take the burden of all the insurance paperwork from you and work directly with your adjuster. We will not turn anyone away based upon insurance coverage. By not being a franchise, we promise to keep our prices low and our quality high. "Based on what I saw they were organized and quick and respected our house." "Excellent - should be added to preferred list!" "Excellent and thorough service. Work was done quickly and they made sure we were safe." "The service was prompt and professional." "Well done, professional and Quick to respond. I couldn't have asked for better help resolving this emergency issue with our home." "They exceeded our expectations. Very efficient and helpful." "From start to finish, DC Eager employees were reliable, thorough, and professional. Helped us deal with a stressful situation." "The service we received from DC Eager was beyond Excellent! The gentlemen (Brandon) was extremely respectful, compassionate and very detail oriented. He explained each and every aspect of the process!" "DC Eager’s technicians were fast at their tasks and very professional! They were also very polite and respectful. I would recommend them to others." "DC Eager responded promptly to our emergency. Their employees were professional, knowledgeable and thorough in their restoration work. They worked late until the job was complete. The men answered all our questions about the damage AND cleaned up when they finished. They came back and took readings and monitored the progress as the basement began to dry out! I would highly recommend them to future customers! Bravo! Great job!" "DC Eager was very professional and helpful I recommend their services." DC Eager's technicians were professional and responded promptly to our call. They were helpful, organized and did a very good job! "DC Eager was efficient, amicable and professional. They were prompt, patient, diligent and I would recommend them to anyone." "DC Eager responded promptly to my emergency call! Everyone was very friendly and calming during a very stressful time for me!"